Every August I have a brief window where I get to step back from the required reading necessary for seminary/ordination coursework and pursue my own interests in the realm of periodicals and books. This is always a very intentional decision; however, I am often accused of not being adventurous enough by choosing not to read fiction. While I appreciate fiction, nonfiction has always been my reading of choice- and yes, it too can be an escape. I confess that my imagination is not as sharp as those, like my wife, who spend vacations absorbed into certain contemporary works of fiction that have been likened to "literary crack." But for me, I find my rest in exploring the depths of philosophical thought, historical events, theological discourse, and other forms of writing that many consider dense and boring. To each their own. Teenage wizards and vampires just do not do it for me. Neither do hobbits and dragons. I wish I enjoyed these writings, but alas, I do not. Theology of Hope by Jurgen Moltmann. A contemporary reformed theologian, Moltmann explores eschatology from a Christian perspective and reminds the church that a theology of hope is not where the Christian ends up, rather where one must begin. I am sure that this book, as well as others by Moltmann, will serve as fuel for future blog entries. 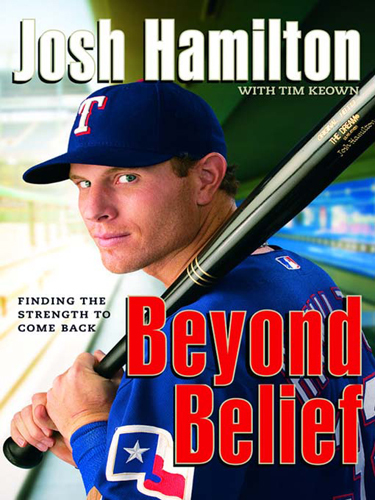 Beyond Belief: Finding the Strength to Come Back by Josh Hamilton withTim Keown. As a baseball fanatic, I look forward to reading about the redemptive story behind one of the game's premier performers, Josh Hamilton of the Texas Rangers. Hamilton was a highly sought after draft pick who eventually struggled with drugs and illegal substances that forced him to reevalluate his identity, image, convictions, and behaviors. He ultimately (re)discovered a faith in Jesus that has led to a radical transformation in not only his personal decisions, but also in his attitude, posture, and witness as a professional athelete. Jacob and the Prodigal by Kenneth Bailey. I selected this book so to explore the Lukan parable from a unique perspective, i.e. as Jesus' retelling of the history of Israel with the narratival backdrop of the patriarch Jacob. The story of the prodigal son, or as Bailey suggests, the parable of the father and his two sons, is one of the most well-known sagas/teachings of Jesus; however, Bailey offers a fresh interpretation that I am eager to explore. Again, I am sure future posts will engage this text and related insights and hypotheses.